Colin Wesley Ward was born at Cootamundra, New South Wales, Australia on 3 January 1943. His father was a farmer and grazier and his mother a former high school teacher (English and Latin). In those days when a female teacher married it meant automatic resignation. He was educated at the Cootamundra Primary School (1948-54) and at Cootamundra High School from 1955 to 1959 passing the Leaving Certificate with a maximum pass of 5 As and 1 First-Class Honour. The Headmaster at that time was Murray Callaghan, an outstanding individual, who on leaving Cootamundra was appointed head of Sydney Boys High School, the premier appointment in the New South Wales education system. A major early influence was Colin’s grandfather, George Gardiner, who even in his seventies would spend hours playing cricket with Colin, his two brothers and his cousin, on a home made dirt pitch on the farm in mid-January in 40 ºC heat. One of George’s brothers was Albert (Jupp) Gardiner who from 1910 to 1926, was a Senator for New South Wales in the Australian Federal Parliament. He became Labor leader in the Senate and was the only Labor Senator from 1920 to 1922. In 1918, he achieved some fame by delivering an overnight speech lasting twelve hours forty minutes, the longest ever in Federal parliament; this forced the introduction of a time limit on future parliamentary speeches. He was an outstanding sportsman who played cricket and rugby for New South Wales in the 1890s. In 1964, Colin completed his BSc with First-Class Honours and University Medal from the School of Wool Technology, University of New South Wales and was awarded a University Blue in rugby union. He was the first student at UNSW to be awarded a University Medal and a Sporting Blue in the same year. As an outside centre he represented the University in Rugby Union at three inter-varsities (was captain in 1964), and was a member of the 1st grade team when UNSW was promoted to Sydney’s First Division Rugby competition in 1966. I asked – what’s it worth? – the reply being £1 200 per annum. I responded: Well it’s not enough, I’m getting £1 800 at the moment. To which Associate Professor Ian Johnston responded: I think we can find another £600; and they did. I resigned from the teacher training program, suggested my own PhD project on the biochemistry of parasitic nematodes (carbohydrate metabolic pathways) and started to read up on the relevant literature at the excellent library at the CSIRO Division of Animal Health’s McMaster laboratory in the grounds of Sydney University. His PhD was carried out as a joint project between the School of Wool Technology and the Department of Biochemistry, School of Biological Sciences and was completed and submitted in late 1967. From 1968 to 1969, he was a Postdoctoral Fellow in the Department of Zooology, University of Massachusetts, Amherst, Mass, USA with Donald Fairbairn working on fatty acid metabolic pathways in parasitic nematodes and returned to Australia in January 1970. His primary aim was to join the CSIRO Division of Animal Health and continue his interests in parasite biochemistry. However when he enquired about a possible position, they advised that they had just made two appointments in that area. However, as was customary at the time, Chiefs of Divisions would circulate such letters to other Chiefs that might be interested. Thus Colin’s letter was sent to Gordon Lennox, the Foundation Chief of the Division of Protein Chemistry, who remembered the name. Lennox had been in the audience at UNSW in late 1967, visiting his former staff member Ted Thompson (who had just taken up the Chair of Biochemistry at UNSW), when Colin gave his PhD seminar. Lennox wrote to Colin saying that they had an advertisement out for an organic chemist, but to ignore that as he felt there were a couple of areas that would be well suited to someone with a background in biology and biochemistry. 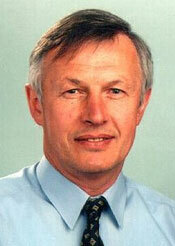 Colin accepted the offer and joined the CSIRO Division of Protein Chemistry in January 1970 as a Research Scientist. He was promoted to Senior Research Scientist in 1973, Principal Research Scientist in 1977, Senior Principal Research Scientist in 1983, Chief Research Scientist (CRS1) in 1987, CRS 2 in 1992 and CSIRO Fellow in 1997. He was Program leader of various Programs in CSIRO from 1980 to 2006, was Assistant Chief of the Division in 1985-87 and 1990-92, and then Deputy Chief from 1992 to 1997. During 1983-84, he was a Visiting Fellow in Bill Rutter’s lab, Department of Biochemistry and Biophysics, School of Medicine, University of California at San Francisco, USA. As Assistant Chief during the major restructuring of CSIRO in 1987, Colin led the push to phase out the agricultural and veterinary research programs and focus the Parkville laboratory’s research on human health and the pharmaceutical industry, a position that was finally adopted (see below). pushing the argument that the Division needed to develop capabilities in Fragment-based Drug Design, a position that was finally adopted. Tom Peat (CSIRO): Structure-based drug design. Colin has a truly wonderful track record in science, covering diverse topics from influenza through virus taxonomy and vaccine discovery, all the way to the insulin receptor. His various career switches from one topic to another have all been at the behest of the Organization and with no regard for the personal preference of staying in an area where he was already internationally highly competitive and highly regarded. Success in any one of these fields would have been remarkable. Success in them all is astonishing. By 2010, Colin had published over 190 papers and three books. In his PhD he was the first to link up all the partial information in the literature on metabolic pathways in parasitic nematodes and other invertebrates. He assayed every enzyme in the glycolytic pathway in the larvae of the sheep parasite Haemonchus contortus and compared each with the corresponding activity in a control vertebrate tissue. The results showed that the enzymes employed by parasitic nematodes were the same as those in mammals except for the terminal steps in glycolysis. He was the first to show that parasitic worms used PEP carboxykinase and malate dehydrogenase (not pyruvate kinase and malic enzyme as previously thought), to link glycolysis to a reverse TCA cycle and the production of volatile fatty acid end products. In mammals these last two steps of the glycolytic pathway are pyruvate kinase and lactate dehydrogenase. In his postdoctoral work at the University of Massachusetts, USA, he studied the metabolic pathways involved in Î²-oxidation of lipids during the free-living embryonic development of the intestinal parasite Ascaris lumbricoides and with John Barrett established that these parasites also employed a glyoxylate cycle to convert fatty acids into glycogen in preparation for the anaerobic metabolism they would need to employ once they lodged in the gut of the host animal. This cycle was previously only thought to occur in germinating plant seeds and microorganisms. His first project at CSIRO was aimed at understanding how insect moth larvae could digest wool (keratin). In a program described by his former Chief Gordon Crewther as an opus magnum Colin conducted a comprehensive analysis of all of the proteolytic enzymes present in the larvae of the wool fabric pest Tineola bisselliella. He found that the insect gut, like that of higher organisms, contained a complex mixture of enzymes. In all he isolated and characterised over 29 proteolytic enzymes from these insect larvae. This work showed that the unique ability of these organisms to digest keratin was not due to the possession of a single enzyme (keratinase). As Colin recalled, one result of his work was the closure of this field of research. The highlight for me was the note from the Editor of BBActa, who on accepting my paper on ‘The aminopeptidases of intermediate electrophoretic mobility’ felt I had exhausted the world’s interest in the enzymes of that insect. I had already published papers on ‘The aminopeptidases of low electrophoretic mobility’ and ‘The aminopeptidases of high electrophoretic mobility’. It was time to move on! Colin started the influenza virus research in the Division in 1972 and over the following nine years cultured and purified over 150 000 chick embryo’s worth of influenza virus. In a fruitful collaboration with Theo Dopheide, they sequenced the haemagglutinin (HA) from two human Hong Kong strains and one bird virus (isolated in 1963) believed to be the precursor of the 1968 Hong Kong pandemic. This sequence data provided much of the framework on which the studies of antigenic variation by nucleic acid sequencing, monoclonal antibody escape mutant selection and X-ray crystallographic analysis were based. A highlight at this time was their prediction in the late 1970s that the haemagglutinin trimers consisted of a coiled-coil. This was two years before the 3D structure of HA was determined by Don Wiley and Ian Wilson at Harvard. Professor Syd Leach was the referee for this paper and suggested that it should be discussed in Nature. It was, in Nature‘s ‘News and Views’ section, 14 years later when Wiley’s lab published the structure of the fusogenic form of HA which revealed the full coiled-coil structure as predicted by Colin and published back in 1980. With Tom Elleman and Ahmed Azad, Colin sequenced the N2 neuraminidase protein heads of one of the last Asian influenza virus strains A/Tokyo/67, by amino acid sequencing and Tom and Azad cloned and sequenced the N2 cDNA from one of the early (1957) strains of Asian flu. This sequence data along with information on the disulphide bond arrangements and the number and nature of carbohydrate moieties attached to the N2 neuraminidase was used by Peter Colman and colleagues to interpret their electron density maps when solving the crystal structure of the N2 neuraminidase heads. This work with Dharma Shukla, Neil McKern, Morry Frenkel, Keith Gough and Xioawen Xiao led to the development of a successful taxonomy of potyviruses, the largest and most complex group of plant viruses with over 200 species and thousands of strains. This problem was believed by international experts to be intractable and its resolution was a major scientific achievement. Their proposals on potyvirus taxonomy have been adopted by the International Committee on the Taxonomy of Viruses (ICTV) and have changed the approach of scientists world-wide to the detection, identification and control of this large and complex group of plant pathogens. Their studies on potyvirus serology and particle assembly led to the development of a new approach to the production of genetically modified, virus resistant plants expressing a broad spectrum anti-potyvirus antibody and to a novel application in the field of vaccine technology using the self-assembly properties and the surface location of the N- and C-termini of the potyvirus coat protein. The transgenic plant work was done in collaboration with Thomas Joseph Higgins and Paul Chu at CSIRO Plant Industry. Colin extended the potyvirus work to a consideration of virus taxonomy in general and evaluated criteria for assigning all viruses (animal, plant and microbial) to a hierarchical classification of strains, species, genera, families, orders, classes and phyla in a Virus Kingdom. Based on these considerations Colin suggested that the current taxonomic assignment of several animal viruses (pestiviruses, hepatitis C virus, rubiviruses, hepatitis E virus, arteriviruses, coronaviruses and toroviruses) and some plant viruses (luteoviruses, some closteroviruses) were wrong. Many of these predictions have now been accepted by the Executive Committee of ICTV. During the 1980s, Colin Ward was asked to initiate a program of research into the development of recombinant vaccines for important veterinary diseases. One project involved establishing the nature of antigenic variation in the 17 serotypes of pili from Dichelobacter nodosus the causative organism of ovine footrot. This was reminiscent of the situation with influenza virus variation. The work, carried out by Neil McKern, Tom Elleman and Peter Hoyne, revealed the nature and extent of variation in the sequences of various pili serotypes and culminated in the development of a recombinant vaccine against this bacterial infection where the bacterial pili were expressed and correctly assembled in the host organism Pseudomonas aeruginosa. The common bacterium Escherichia coli could express the pilin protein but lacked the appropriate assembly machinery to form morphological pili. The second project was for a vaccine against the Birnavirus, infectious bursal disease virus (IBDV), a major pathogen of the world-wide poultry industries. The research team led by Colin Ward, Ahmed Azad and Kevin Fahey were the first to describe the total gene sequence of a Birnavirus and the mechanism by which the viral genome translation products are converted to functional viral proteins. The research culminated in the development of the first recombinant subunit vaccine for veterinary purposes. It was internationally recognised by the award in 1983 of the B Rispens Memorial Award for Avian Pathology and the CSIRO Chairman’s Medal in 1997. In a third vaccine project Dr Ward led the group that identified and cloned several candidate antigens against the parasitic nematode Trichostrongylus colubriformis. In collaboration with Barry Wagland, Division of Animal Health, Colin established a correlation between gut hypersensivitity and resistance to re-infection, and showed that 3rd stage larvae were the major cause of this hypersensitivity response. This suggested that modulating the immune response to reject the early stages of infection may be a possibility. All of these vaccine projects were carried out in collaboration with CSIRO Animal Health. In 1990, Colin convinced the CSIRO Executive and his new Chief Peter Colman to initiate a research program to determine the 3D structure of the insulin receptor amidst strong competition from several pre-eminent crystallography research groups internationally. This work was outstandingly successful with structures of the L1-CR-L2 domains of both IGF-1R [Garrett et al., 1998, Nature, 394: 395-399] and IR [Lou et al., 2006, Proc. Natl. Acad. Sci. USA, 103: 12429-12434] as well as the structure of the whole IR ectodomain dimer [McKern et al., 2006, Nature, 443: 218-221]. The latter structure is striking and reveals an unexpected folded-over conformation that suggests how high-affinity ligand-binding in the IR dimer is achieved. In an extension of this program Colin’s group teamed up with Tony Burgess’ group at the Ludwig Institute for Cancer Research in 1997 and solved the structure of two members of the epidermal growth factor receptor family. These were the 2:2 EGFR complexes with TGFÎ± [Garrett et al., 2002, Cell, 110: 763-773] showing the unexpected back-to-back dimer interface induced by ligand-binding; and the structure of ErbB2 [Garrett et al., 2003, Molecular Cell, 11: 495-505], which was shown to be always in the activated state, poised to interact with other members of the family once they bound ligand. Following the retirement of Gordon Crewther in November 1983, Bruce Fraser was appointed Acting Chief of Division and, in February 1985, accepted the position of Chief. Colin Ward who had been an applicant for the Chief’s position, was appointed his Assistant Chief. Together, following an internal review, they reorganised the research programs in the Division and several staff were transferred from wool research to other areas. Later that year, on the 1st September 1985, Bruce commenced a five months stay at the National Institutes of Health (NIH), USA as the first part of a 12 month Fogarty Fellowship. During this period Colin Ward served as Acting Chief of the Division. The period following Bruce’s return from NIH proved to be very stressful, marked by the upheaval that occurred in the wake of the McKinsey report into CSIRO. On the 28th May, 1987 the findings of the McKinsey and Co review were released. Its effect on the Division of Protein Chemistry (DPC) was major, as it recommended that the Division be split up into three parts. The Hides, Skins and Leather Program was to be attached to parts of the Division of Food Research to form a new Division, to be called Meat and Livestock Processing; the Wool and Fibrous Proteins Program was to be combined with the Divisions of Textile Physics and Textile Industry, to form the new Division of Wool Technology; while the remainder of the Division of Protein Chemistry (DPC) was to be amalgamated with the Division of Molecular Biology (DMB), North Ryde, the Biological Organic Chemistry group from the Division of Applied Organic Chemistry, and the Biotechnology and Industrial Microbiology Programs of the Division of Chemical and Wood Technology (DCWT), to form an expanded Division, to be named Bioactive Products. The Division of Protein Chemistry found itself in the difficult situation where its Chief and Assistant Chief had differing views about the future of the Division. Bruce wanted the wool research to continue while Colin favoured the phasing out of wool research at the Parkville site and the move to biotechnology. In May Colin wrote to the Acting Institute Director, Warren Hewetson, agreeing with the proposed amalgamation of DPC, DMB and the two programs from DCWT, but suggested that the proposed new name (Bioactive Products) was inappropriate, and that Division of Biotechnology was preferable. He also argued that it was essential to follow through with the proposed rearrangements by bringing the DCWT staff from Clayton to Parkville, a move that would necessitate shifting the Wool and Leather groups off site. In a subsequent letter to the Acting Director, David Solomon, he also proposed that staff in the Wool Group be given three options: (i) redeployment to appropriate programs in the new Biotechnology Division, (ii) redeployment to the Hides, Skins and Leather Program or (iii) transfer to Wool Technology at Geelong. With regards to the first proposal – the offer was never made and it took until 1990 before there was final agreement to move the Wool and Leather Programs (both now part of the Division of Wool Technology) to Geelong and Clayton respectively. This decision came after much agitation from inside and outside CSIRO during 1989 and the first six months of 1990. Various proposals were put forward to preserve wool research on the Parkville site. Throughout this period Colin refused to compromise and stressed the need to consolidate the Melbourne activities of the Division of Biotechnology. On the 4th August 1987, Dave Solomon announced to the Parkville staff that Bruce had decided to take early retirement at the end of August. He also announced that Colin would not be appointed Acting Chief for the interim period while the search for a new Chief was undertaken. The search for a new Chief proved difficult and a review of the strategic directions of the Division was undertaken by Keith Boardman (CSIRO CEO), Colin Adam, Alan Donald and Jim Peacock. With the help of Peter Colman and other senior colleagues Colin (who was Officer-in-Charge at the time) drafted a 14-page submission from The Parkville Laboratory that argued that the new Division should phase out its collaborative agricultural and veterinary research programs and concentrate on biomolecular research with a focus on the pharmaceutical industry. The suggested areas of research were: antiviral agents, receptor biology, gene regulation and therapy, protein engineering and biomaterials. This position was accepted and in December 1989 Peter Colman was appointed Chief. The Division’s name was changed to Biomolecular Engineering. Colin served as Peter Colman’s Assistant Chief from 1990 to 1992 and as his Deputy Chief from 1992 to 1997. From 1997 until his retirement, Colin continued as Leader of a variety of Research Programs/Themes in the various Divisions (Molecular Science, Health Sciences & Nutrition, Molecular & Health Technologies) formed by mergers and demergers over the next decade. My memory of you of course is not as a scientist, but when you traded the lab coat for the boxing gloves as we fought for the survival of the Parkville Lab back in the late 1980s. As a then young administrator it was a privilege being in the bunker with you, Bob Blagrove, Peter Colman, etc. as we resisted the push to merge and be marginalized by the Sydney labs. While at the time challenging and frustrating, I have often reflected on my time at Parkville and the political battle we had to fight as an exhilarating experience and a great learning experience for my career. To have stood up and through persistence and belief [and some smart operating] to have turned things around and won, was most satisfying. I learnt a lot from that time and from you in particular in terms of how to be a leader, and have called upon that experience as I have had to fight some organizational battles in my career since then. So when you reflect on your achievements please remember to look beyond the science [as important as they are] as your role in ensuring the survival and success of the Parkville Lab cannot be overstated. Part III – Publications and Patents. It was reviewed by Professor Ian Rae for Chemistry in Australia in May 1997 (see Related information below). The proof of the cover for The Lennox Legacy. The final version did not include the magenta. The image is an interpretation of the projected map of an alpha helical coiled-coil protein obtained by electron diffraction of unstained crystals (Bullough P, MRC Laboratory of Molecular Biology Cambridge – Tulloch P, CSIRO Division of Protein Chemistry). Towards the end of 2006 I discussed with you, briefly by phone, a couple of ideas I had with regard to the promotion of CSIRO’s achievements both within and outside the Organization. It was based on my feeling that if I, or any senior CSIRO scientist, were asked to name the 10 major achievements of CSIRO over the last decade, we would struggle to answer it. We all know of the things our own Divisions have done, but not those of the broader Organisation. Geoff’s response was enthusiastic and the result is CSIROpedia. 1967 CSIRO Postgraduate Studentship. A total of 20 CSIRO Studentships were available in 1967; only one being awarded to the University of New South Wales. 1966 General Motors-Holden Postgraduate Fellowship. One of three awarded to the University of New South Wales. Twenty-five in Australia by the Australia Vice Chancellors Committee. Dr Ward was also an Executive Committee Member of the International Committee on the Taxonomy of Viruses from 1996 to 2002.